Art deco pieces can transform the overall look of your room. The best example is the Vermont wall mirror. 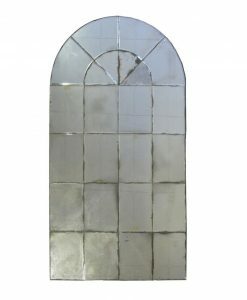 This wall mirror consists of 4 squares, 2 rectangular and one circular piece of mirrors that are arranged in a perfect combination to create an excellent piece of the wall mirror. All these mirror pieces are attached to an MDF backing that provides strength and durability to the entire piece. The antique silver finish of the MDF is visible through the gap of the mirrors thus creating an illusion of beautiful lines. The Vermont wall mirror can be displayed either as a single piece or as a combination piece of two wall mirrors. It can also be paired with the floor mirror from the same collection thus creating a beautiful look indoors. Place the wall mirror against an accent wall in a neutral or bold shade, it is sure to grab the attention of your guest.